The price/earnings ratio (P/E) has a multiplier effect on stock returns. Over 10–20 years, it can dramatically increase or decrease your total return. In the secular bear market of the 1960s and ‘70s, shrinking P/E ate away almost all the return from earnings growth and dividend yield. In the 1980s and ‘90s, rising P/E more than doubled the return for investors. But P/E’s effect goes beyond earnings and capital gains. It has a big effect on dividend yield, too. 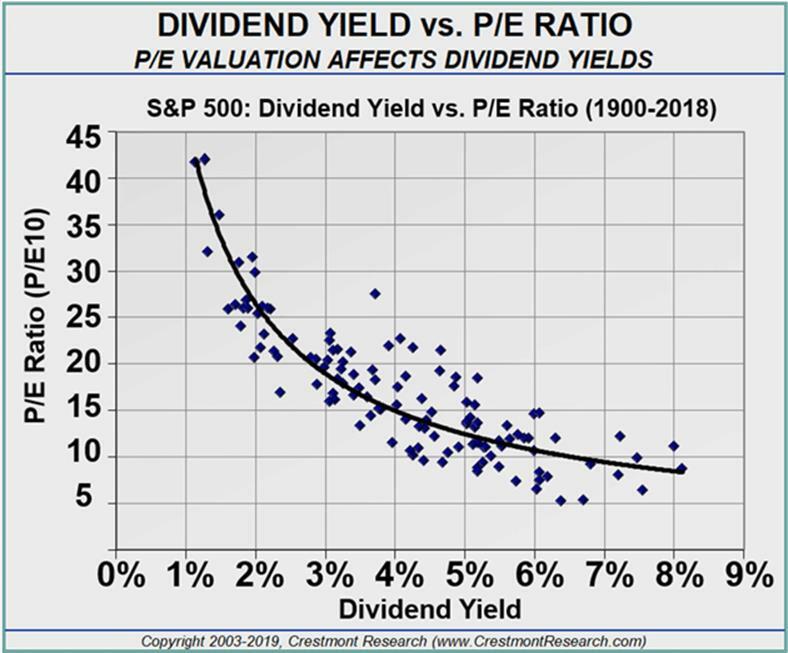 The chart below shows a high correlation between P/E ratio and dividend yield. Historically, High P/E leads to low dividend yields and low P/E leads to high dividend yields. For example, the same dividend yield is twice as big under P/E at 10 than it is under a 20 P/E. Bottom line: a low P/E raises the odds of both higher returns and higher dividend yields. So, where is today’s market on the valuation spectrum? Actual reported earnings show that today’s P/E stands near 20 and up to 30 in a few instances. The long-term historical average is around 15. P/E has declined below 10 only during periods of high inflation or significant deflation. And when inflation is low and stable, it rises toward the mid-20s. That means P/E is now above average. The question is: is it fairly valued? 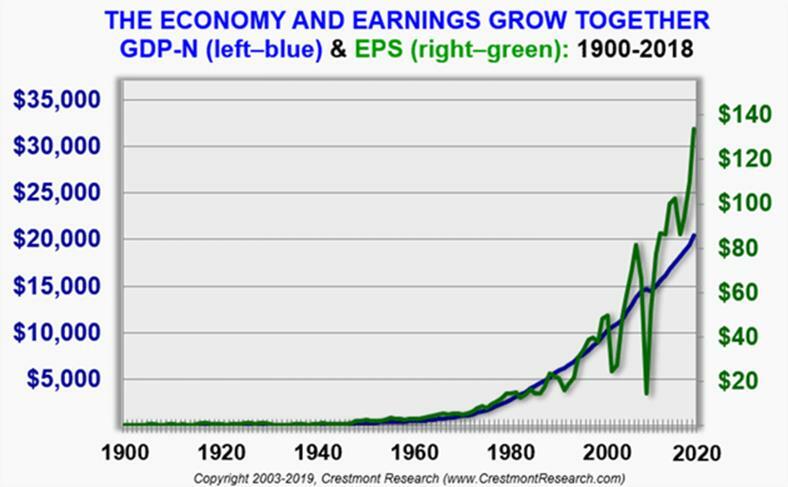 The next chart shows a long history of economic growth (measured with nominal gross domestic product) and earnings growth (measured with earnings per share for S&P 500 companies). Some investors believe the elevated corporate earnings are unlikely to revert. They cite tax changes, trends in service industries, technology, and other causes. Yet all those factors have affected the economy for more than a century. None have prevented business cycle-driven reversion. Plus, if we were earlier in the cycle, P/E would be near 20 and the market would be fairly valued. That’s not the case today. Using various methods to normalize the business cycle shows us that P/E now is near 30. As such, the market is at high risk of correction. Warren Buffett’s first rule of investing is: “Never lose money.” His second rule is to never forget the first rule! It’s true because losses have a disproportionate effect on future returns compared to gains. The relationship works in both directions. A 40% loss can wipe out a 67% gain. 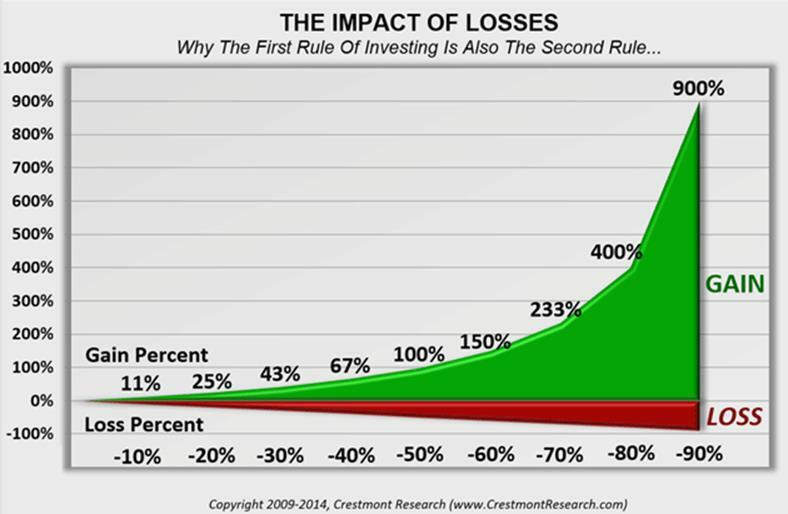 Likewise, a 40% loss requires a 67% gain to recover. This disproportionate effect occurs because the loss occurs on the higher value. You can achieve diversification portfolio-wise in a number of ways. First, hold securities not correlated with each other so the portfolio’s engines work independently. Second, include holdings that are historically counter-correlated. These holdings are expected to zag when other holdings zig. The goal is not to find direct offsets, but rather to expect that each component will deliver more upside than downside. And don’t let this discourage you altogether. The outlook of low returns is not destiny. It is only a statement of current market conditions. Recognizing it helps you better manage investment portfolios. There are many options for your portfolio other than investing in highly valued stocks. Ask your investment advisor about such options.